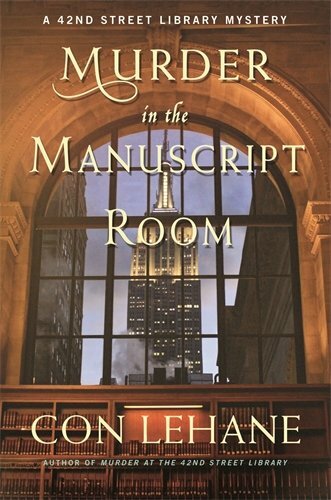 Con Lehane, in his recent mystery Murder in the Manuscript Room has enough twists and turns to keep any reader interested. Just when one thinks they know what’s going on, Lehane throws in another curve and takes the reader down a new path. Raymond Ambler, the curator of the crime section of the 42nd Street Library is introduced to Paul Higgins, an ex-cop and sometime author, by Ambler’s friend Mike Cosgrove, a homicide detective. Higgins has a plethora of data that he wants to give to the library, provided no one has access to it. A difficult position for a library! As they talk, Ambler’s coworker and unofficial love interest, Adele Morgan, encounters the group as she is walking with another librarian, Leila Stone. One look at the group and Stone takes off, disturbed and upset. Adele tries unsuccessfully to calm the woman, but the only thing Leila will say is that her ex-husband is looking for her, and she is terrified of him. One of the story twists describes when Ambler visits his son John in prison, and John relates a story about a mutual friend, also in prison, who wants Ambler’s help in getting him released, saying he is in prison for a murder his younger brother committed. As much as Ambler wants to believe his friend, he finds it difficult until he starts researching the murder of a union president that occurred several decades earlier, and Higgins’ donated paperwork comes into the picture. In the meantime, another twist occurs when Leila tells Adele that a young Arab, Gobi Tabrizi, who is doing research work at the library, has raised her suspicions about what kind of research he is really doing. Before Adele can put those pieces together, Leila turns up dead, shoved into the bookshelves in Ambler’s office. Ambler takes it upon himself to uncover why Leila was murdered and who the culprit is, while at the same time dealing with a legal suit over the guardianship of his grandson, Johnny. Suddenly, a high priced security company run by Brad Campbell takes Leila’s homicide out of the hands of the NY Police Homicide Unit and away from Mike Cosgrove. Now Higgins’ files are found opened and ransacked, Tabrizi becomes the number one suspect, Paul Higgins is found to be Leila’s ex-husband, and Leila is not Leila at all . . .
Adele travels to Texas for Leila’s funeral and meets the woman’s cold father and warm/chatty best friend. While there, she is approached by several men demanding to know what information she may have gathered from Leila. Meanwhile, back in New York, Ambler continues to work with Mike Cosgrove, and McNulty, a friendly bartender, to determine if there is a connection between Leila’s death and that of the union leader years ago. Cosgrove’s daughter, Denise, who takes care of Ambler’s grandson, Johnny, has gotten herself into trouble with drugs, and Campbell’s security agency has the pictures to prove it. Of course, they won’t use the pictures if Cosgrove comes on board with them. Just as the pieces of the puzzle start to come together, Adele is called to meet Higgins, and when she shows up at McNulty’s bar, a large SUV careens around the corner and up the street, and a passenger opens fire on Higgins, cutting him down where he stands. The maze of events that Lehane has created seems to go nowhere . . . only around in circles on more endless pathways. While the premise is a good one, and the maze is kind of fun to wander through, Lehane takes a lot of the investigation work out of Ambler’s hands and lets other characters take the lead. Adele, Cosgrove, even the bartender, McNulty, each take a turn at hunting for and finding clues. As each of these characters searches for and finds evidence on their own, then turn it over to Ambler who puts the pieces together—evidence that eventually leads to the connection between the three murders, and identifies the guilty party. For the mystery aficionado, the guilty party is easily picked out of the crowd. It feels like all of the sharp turns in the story are woven together loosely—it doesn’t always feel like a tightly knit set of circumstances. There are places where the writing seems authorial and slow, but having said that, the story moves along well and is an easy read. It is not disappointing and is a good one for a chilly night.